An Apple and An Adventure comes out in June 2017. Win a signed copy + original art by Martin Cendreda here! Today, guest blogger Martin Cendreda, illustrator, animator, comic book maker, and author, shares with us a behind-the-scenes look at the inspiration behind and the making of his latest picture book, An Apple and An Adventure. Win a signed copy of his book and an original print by Martin by entering our drawing contest. Without further ado, here's Martin! This was one of the earliest drawings of the cave girl and her triceratops pal. I added the text sometime later, when I decided I wanted to make a self-published zine using them as the main characters. When I first drew them, I was thinking of making a comic, but at the time, my kids were learning how to read. Consequently, I was reading a lot to them, and vice versa, so I thought why not make it a kids zine (the book thing came later) My friend John has a risograph machine, which is like a fancy color printer, and he agreed to help me print the zines. My friend Dave owns a comic book, The Secret Headquarters, here in LA and he could sell them there. Perfect! These are 3 books that were huge inspirations to me, when I started. TOP: The Wonderful Egg by Dahlov Ipcar, bottom left: Moke and Poki in the Rain Forest by Mamoru Fuani, bottom right: Destined for Dizziness by Souther Salazar. Dahlov Ipcar is one of my all time favorites! Sadly, she died a few months at age 99. She was working right up until her last day, one of the hardest working artists around. I made little booklets from regular old copy paper (folded over, stapled through the middle, then cut in half). In them, I would write a whole bunch of alliterative sentences using the letters of the alphabet. Then I would sketch out scenes to match them. I would do these sketches at a cafe for 30 minutes before work started. It was my favorite time of day, just drawing and drinking coffee. Nothing better! Once I settle on the dimensions of the zine. I made a mock-up from sheets of 8.5 x 11” paper folded in half and stapled. I would re-sketch my initial sketch ideas to fit this format, then cut and paste them into the mock-up. This mock up gave me a rough idea of what the finished zine might look like. It also gave me a chance to edit words and/or pictures that I wasn’t happy with. This part was really messy but so much fun, cutting, pasting, taping things into a little booklet. Computers. Once the mock up was done, I scanned it into the computer, page by page. Then I would clean up the sketches a little more in Photoshop. Then I would draw clean lines over that. I use a Cintiq, which is special monitor that you can draw with. Once the linework was done, I then colored each drawing in photoshop. I then printed out the images on John’s risograph machine, using my old mock-up to determine which images go on which side of the paper. Then I took all those print outs to a copy place where they assembled them into booklets, stapled them, and trimmed them down to the final dimension. And voila, zines! Matt Gagnon, Editor in Chief over at Boom, bought the zine version at Secret Headquarters. He liked it so much, he offered to re-publish it in a nicer, hard-cover edition. How could I say no! All the artwork was mostly done, all I had to do was clean up the lettering, draw some endpapers, and add some things to the cover. Here are some pics comparing the zine version to the book version. More images of the final book! 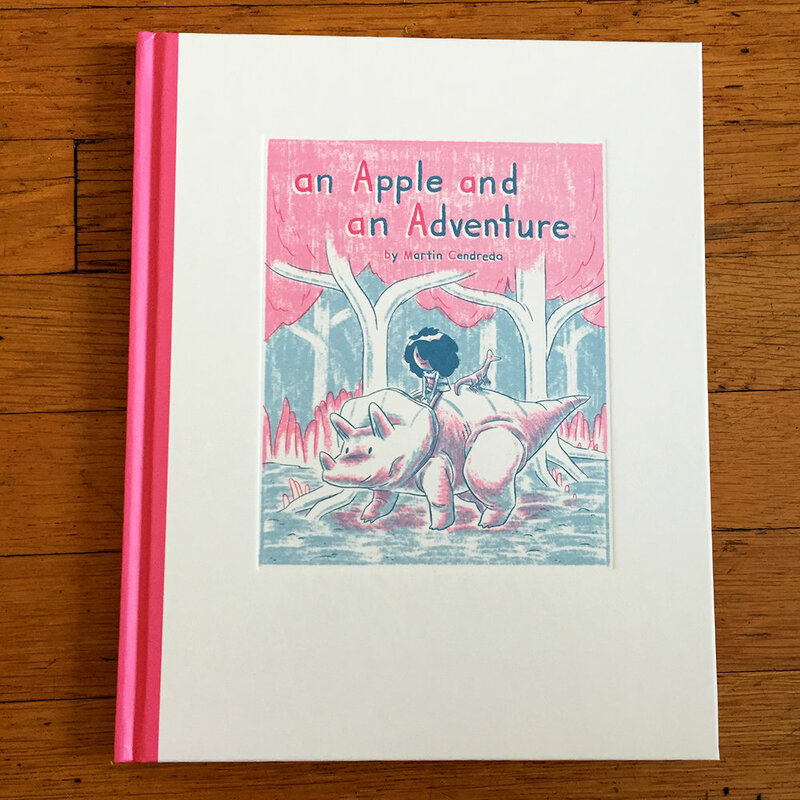 We hope you enjoyed reading about Martin's process in creating An Apple and An Adventure, from inspiration to sketching, zine-making, and printed hardcover picture book! Don't forget to enter our drawing contest to win this book and an original piece of art by Martin.